Fudgy chocolate thumbprints are filled with a swirl of peppermint chocolate kisses! The holidays just got sweeter! Chocolate Thumbprints Are A Must! I’m hoping these chocolate thumbprints, these will help me relax and enjoy the holidays. Christmas brings out the worst in me. It brings out my obsessive nature. No matter when I actually start my shopping, as soon as the first present has been purchased, I find I cannot relax until I have everything (including stocking stuffers) hidden away to be wrapped later. I’ve never been one of those people who could buy a gift here or there or casually do a little online shopping. No, it’s truly all or nothing with me. Once I start, it’s a race to the finish. I purchased my first gift, the day after Thanksgiving. A week later I was able to check everything off my list. I’m not bragging here. It’s a sickness I tell you. I can actually feel my blood pressure rising when I know I have gifts left to buy. When it comes to my own kids, it’s even worse. Not only do I have to buy the same number of gifts for all three, but it’s my goal each year to spend the same dollar amount as well. I actually have spreadsheets to help me keep track. It’s ok, you can say it. I’m a N.E.R.D. But there’s something so gratifying about being able to make everything come out even. The frightening thing is, I see the obsessiveness in my children! So, now that I can no longer obsess over my shopping, I’ve moved on to obsessing over baking. Each year, I make dozens of cookies and candies to give as gifts and I make several dozens for us as well. Well, here it is, December 3rd, and I’m feeling like I haven’t baked enough. I have ingredients, I have my to-do list, but my cookie tins are empty. It’s totally stressing me out and making me anxious! Will I get it all done??? AAAHHH!!! I’m biting my nails as I type!! 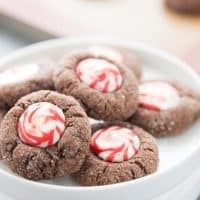 Thankfully, I did manage to make these festive chocolate thumbprints, these chocolate peppermint cookies as well as this Peppermint Hot Chocolate Bark. I feel confident these will give me enough energy to complete my baking list! We always had thumbprints on our cookie tray growing up. My mom would roll them in nuts and fill them with jelly. I can’t say I ever cared for those. But thumbprints are nevertheless nostalgic for me. I made my cookies with chocolate instead, just the way I like ’em! I used peppermint Hershey kisses to fill them. It really bums me out when my kisses fall out of my cookies, that’s why I melted mine down a bit. I think the white chocolate Kisses look so pretty with these chocolate thumbprints, don’t you? And you know what? They taste as good as they look! 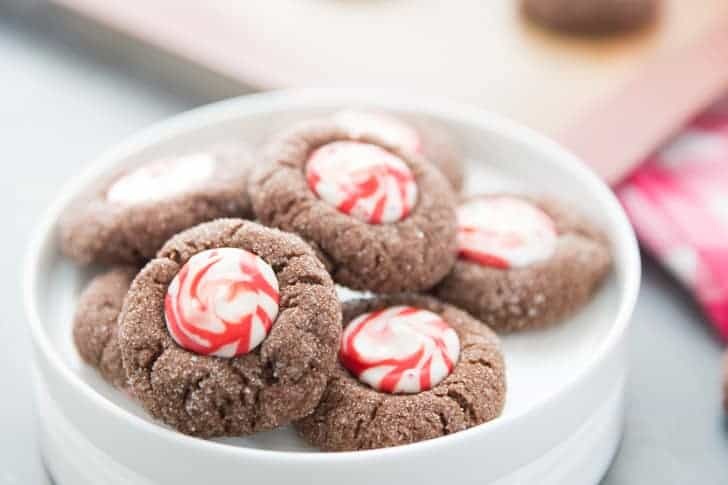 Chocolate thumbprint cookies rolled in sugar, baked, and adorned with a peppermint Hershey Kiss! Preheat oven to 350. In a medium bowl, combine flour, cocoa powder and salt, set aside. In a large bowl, mix together butter and 1 cup of sugar on medium high until fluffy, about 3 minutes. Add egg and vanilla. Slowly mix in flour mixture and mix until combined. Place remaining 1/2 cup sugar in a small bowl. Roll dough into 1 in balls and roll in sugar. Place cookie on a lined cookie sheet, about 1 inch apart. Bake for 5 minutes. Remove from oven and using a rounded teaspoon, lightly make indentation into each cookie. Return to oven for 4 minutes. Top each cookie with a Hershey Kiss and return to oven for 1 minute or until chocolate is slightly melted. Remove and swirl melted chocolate with a spoon to smooth. Let cookies stand on baking sheet for a minute to set before moving to a cooling rack. You do mean flatten the mint with a spoon, right?? Not the chocolate cookie??? Chocolate mint anything is for me. Love it. Pinned it. Thank you for sharing. Thanks Sue, I love chocolate and mint together too! 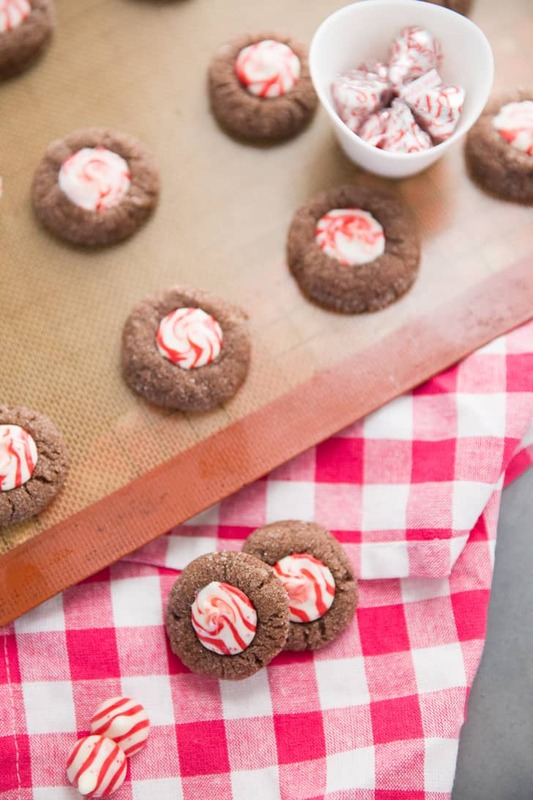 Those white candy cane kisses are the perfect touch to the chocolate thumbprint cookie! Adorable!! Great idea to use Hershey’s Peppermint Kisses! They are the perfect addition to the chocolate cookies! Yum!! These are my favorite ever Hershey kisses! The cookies look amazing! I am hosting a Christmas cookie blog hop and would love for you to come share these! I love these Kisses too! Thats why they had to be in cookies or else I’d eat the whole bag!!! Ha ha! You should bring your spreadsheets to my house and take charge of my life! I can be a little obsessive, too, but I’m not organized enough to do spreadsheets! Awesome cookies! Thanks Rachel! I might be taking it too far with the spreadsheets! 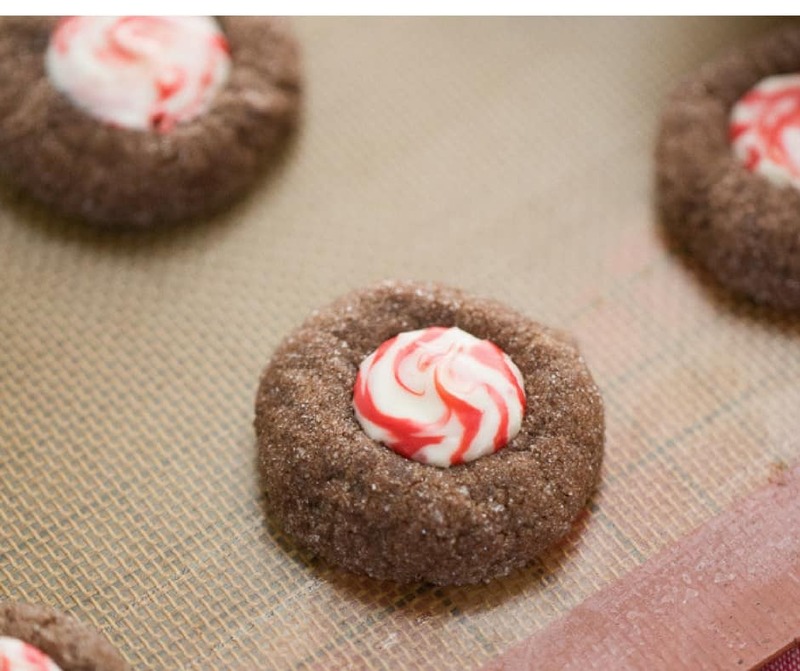 Love that you use Hershey peppermints kisses in these cookies. 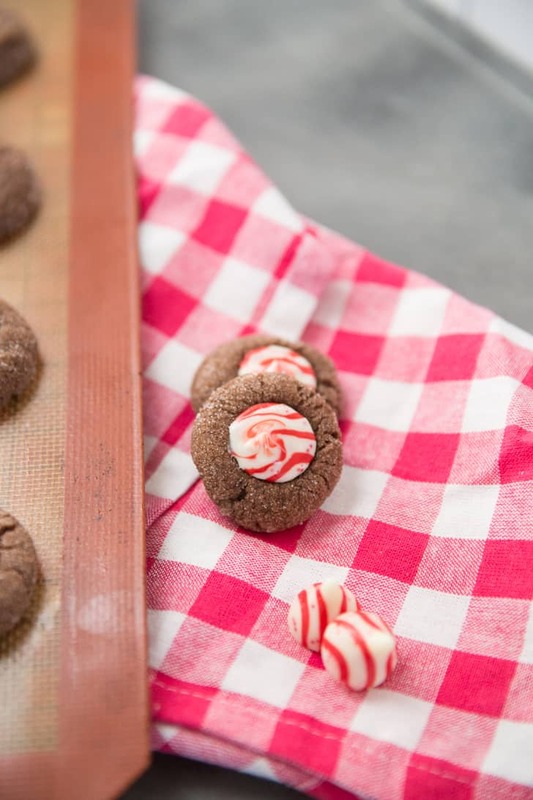 Peppermint and chocolate are such a classic holiday combo and they’re perfect here. Thank you John, I feel better knowing I’m not alone! I SHOULD start later, then it would make sense to shop like there’s no tomorrow! Besides, I spend more if I shop early! Thanks for stopping by John. Thanks for sharing your recipe! And it is also reassuring that I am not the only one who gets all OCD about everything!! Thank you for sharing that too!!! Visiting from the Made by you Monday link party! Thanks for visiting Shelley! OCD is right! Holy smokes, these look riDONCulous. So delicious! Can’t wait to try them. Yum! These look so good. I’d love for you to share these at my December Recipe Swap. Hope to see you there. these look amazing!!! I wish I would have seen this recipe before our neighborhood cookie exchange! Awe, too bad! They would’ve been a hit! Thanks Jamie! My mom never made thumbprint cookies, but they are popping up on the internet though I agree with you on not caring for fruit or nut filled ones. Ones with chocolate… that’s my kind of cookie! Anything with chocolate is my kind of cookie! Gosh, I would eat a bunch of those right now! Love, love, love these! I’m featuring these at this week’s Thursday’s Treasures. Can’t wait to see what you bring this week. Thank you so Kuhn Joan! Your cookies look beautiful!! So festive! I wish I could just dig right in. I’m loving the peppermint-chocolate combination this season! And, thanks for visiting Nom Yum & Free. I’m so glad you found me, as I’m enjoying all your tasty looking treats. I will have to try making some of these allergy friendly for my family! Thank you Devin for returning the nice comment!!! Wonderful having you! Nothing like a waste of ingredients. Your recipe has no leavening agent in it so these came out a big blobby greasy mess that looked like truffles. Awesome waste of 1/2 lb of butter and more. I’m so sorry Sarah. This recipe is different than what you are used to, it does not use baking soda or powder. Often,thumbprint cookies are made this way. I am sorry about your wasted ingredients. My cookies came out a little dry. What did I do wrong?I’m going to a cookie exchange and I think the peppermint thumbprints will be a big hit. Hmm, my thoughts would be, do not over mix your dough and be sure to measure your flour exactly; both of these could leave to dry cookies. The cookies themselves will be a litte “hard” they are not a chewy cookie. what a great cookie to kick off the holiday baking season! These cookies look amazing with those mint topping!